Glaucoma is an eye condition caused by damage to the optic nerve. It occurs when the fluid (called aqueous humor) that normally flows into and out of the area in the front of the eye fails to drain correctly. As fluid builds up, it increases pressure inside the eye. Over time, that pressure can damage the optic nerve that sends visual signals from the retina to the brain, and could potentially lead to blindness. An estimated 3 million people in the United States have glaucoma, but only about half of them are aware they have the condition. 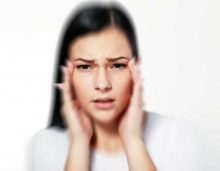 One reason why so many Americans have not been diagnosed is that glaucoma symptoms usually don?t appear until the disease has already progressed and sight is threatened. It?s important to get familiar with glaucoma symptoms, and alert your doctor right away if you have them. Two types of glaucoma exist. Open-angle glaucoma is the most common form. It occurs when the meshwork through which the aqueous humor normally drains out of the eye doesn?t work as well as it should. Closed-angle (or angle-closure) glaucoma is caused by a defect in the drainage system that can lead to a blockage. If the drainage angle is completely blocked, eye pressure will build at a very quick rate?fast enough to lead to blindness within one or two days if it isn?t treated. Open-angle glaucoma symptoms usually don?t start in the early stages of the disease. As the optic nerve becomes more damaged, you might notice blank spots in your field of vision. Closed-angle glaucoma symptoms come on quickly, and can include severe eye pain, blurry vision, headache, nausea, vomiting, or halos around lights. Closed-angle glaucoma is a medical emergency. If you have these symptoms, go to a hospital or call your local emergency number right away. Doctors can save your sight with quick treatment, which usually involves creating a tiny hole to let the fluid drain and relieve pressure. What Is Astigmatism and Why Does it Make Your Vision Blurry? 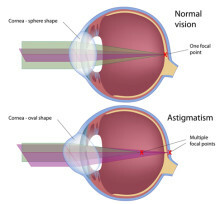 Astigmatism, for a relatively common eye condition, is not an especially well-understood term. Simply put, it’s a condition that results when your cornea is irregularly shaped.